The example is made in Lion Brand Homespun. Row 1: Ch 3, tr in first ch, (ch 3, tr in last ch sp) until you have made desired number of tr/ch spaces. Make a number of tr/ch spaces that is a multiple of 3 plus 1. Row 2: Ch 4. Without turning the work (tr stitches will be on top, chains on the bottom), make 2 dc in first tr/ch space (over tr just made). Working across the tr/ch spaces, (dc in the next sp, ch 1) twice ** shell in the next sp, (dc in the next sp, ch 1) twice. Repeat from ** across to the last tr/ch sp. (2 dc, ch 1, 1 dc) in the last sp. Row 3: Ch 4 and turn. 2 dc in ch-1 sp, (dc in next ch-1 sp, ch 1) twice ** shell in next ch-1 sp (which is the ch-1 sp of a shell), (dc in next ch-1 sp, ch 1) twice. Repeat from ** across to ch-4 turning chain. (2 dc, ch 1, 1 dc) in ch-4 sp. I love your patterns. Especially these no beginning chains. I like the way it makes the bottom look. Is there any way to subscribe to your blog and have it delivered to my email? My web guy (husband) is working on this. We will be doing it through a forum format. I’ll let you know when it’s up and running. I love so many of your knit and crochet patterns. Our stitching group knits and crochets tiny sweaters, hats, booties and small blankets for the local NICU hospitals memory boxes. I was wondering if you have a tried and true way of gauging how many stitches are required for certain size blankets either knit or crochet. We have to knit or crochet blankets in sizes 12×12, 18×18 or 24×24. We mostly use baby yarn but at times also use a soft worsted weight or sport weight. I pick one of your patterns but it takes me forever to try to get the correct size width. The length isn’t a problem. The most tried and true method is to knit or crochet a swatch using one repeat of the pattern, then use the measurements of that swatch to determine the number of repeats will be the width you need. Some patterns have bigger repeats and may be difficult to fit into very specific widths. Thank you. That really helps and I will try that the next time. Do you have a newsletter? If so, how can I get on the mailing list. Thank you so much. We are in the process of setting up a system that will allow readers to sign up for notifications and newsletters and participate in a forum. I’ll let you know when we have it up and running. I’d really like to be able to subscribe to your site, please let me know when this is possible. I have been knitting for over 47 years and crocheting for the past 10, you still have managed to teach me something different. Thank you for the no beginning chain patterns. Such a time saver. I don’t have a subscription system yet, but we are working on it. I will definitely let you know when it is up and running. love this new technique of crocheting. Been knitting and crocheting since I was 5 and am now a great great grandmother. This is the most interesting pattern i’ve seen in 54 years of crocheting. I love it!!! do you have a video for this? I seem to not be able to follow your pattern – I don’t understand what you mean by twice – I am new to reading patterns. Could you please specify how many total dcs in each tr space for Row 2. Thank you so much – I love this pattern and would really like to make this. I don’t have a video of this one yet. I have a backlog of video requests and haven’t been feeling well for a while. For the next row, after the first 2 dc in the ch 1 space (which is the chain between the 2dc and 1 dc), you will make a shell in the ch-1 of each shell and will make one dc in the ch-1 spaces that followed each of the single dc of the prior row. On the preceding row, there was not a ch-1 after the shell but there was one before the shell, so when you are working back across that turned row, the ch-1s will be between the two single dc and after each shell. Thank you so very much for your efforts to help those of us who are not so proficient in our crochet efforts. I am just learning at the tender age of 78 and it takes supreme effort most times but you make the effort easier. I am starting the “No Beginning Chain Quick Shell and Lace Blanket” today in a variegated mohair/silk blend, pastel colors. Hope for the best. Thanks again. Thank you for your comment. I am 60 and a beginning crochet artist. My mother, her mother,and her mother were so talented. But I have struggled with crochet. Finally, I am getting it with videos. Quite fun! can you do the graph on this one next? I just love your site I am getting up in years and am looking for the easier patterns. I used to do all kinds but now I just find that the easier ones aren’t so stressful to do. Thank you for having this site, I really appreciate it. Do you have a border pattern for this afghan? I want to make it in a so,I’d color with a contrasting border. Love all your patterns but I have a hard time with the “no beginning chain” part of this. Is it possible to do this with beginning chain and triple crochet as row 1? I’d really like to make this as a Christmas gift. Thank you. Begin with a chain that is a multiple of 9 plus 5 chains. Use this as your row 1, then skip to row 3 and repeat row 3 for the blanket. Row 1: Make 2 dc in the 5th ch from hook, skip 2 ch, dc in the next ch, ch 1, skip 1 ch, dc in next ch, ch 1, ** skip 3 ch, shell in the next ch, skip 2 ch, dc in the next ch, ch 1, skip 1 ch, dc in next ch, ch 1. Repeat from ** across to the last 4 ch. Skip 3 ch, (2 dc, ch 1, 1 dc) in the last ch. Thank you so much for your instructions. I will be starting this within the week. I love these No beginning chain patterns! I just finished one I used as a cowl for my daughter! It turned out great (after trial n error an your tourital! Thanks! Keep on posting! Thank you so much for some beautifully written patterns. They were so easy to access and they printed off wonderfully. I appreciate you sharing. Will have to try this no beginning chain pattern! I love your innovative patterns. Hope you are feeling better! This looks like a lovely afghan to make. Could you please tell me and show me how to do a triple crochet. I am all set on the other stitches mentioned to complete this project. Thanks for the help. I followed the chain just fine. I think it is a good way to start any pattern. I tried it, but I had a problem following the pattern on row 3. It just didn’t look right. The basic gist of this blanket is that in the dc “lace” columns, the dcs will naturally alternate in relation to the ch spaces. On the row you are making, the dcs are before the ch spaces, but in the prior row, because the work was turned, the ch spaces are before the dcs. very much for such a lovely display of free patterns. though am from africa, but i love this pattern. My question is ..’after row 3, am i to be turning the project until the end of desired lenght? Thank you. Yes. It is only before the 2nd row that you do not turn. Thereafter, turn as usual before each row. Thank you for the “no beginning chain” patterns. I am a beginning crocheter and self taught and I HATE beginning chains! I am going to try one of these for my sister for Christmas. Thanks again! I cannot seem to get this to lay flat it ripples on me.I have done as the pattern reads.. the picture you put up lays flat. my piece i am trying to make is far from being flat. I have read the blogs that others leave and i followed what you typed out and i am correct in my stitches. If I put more rows on this pattern it does not seem to lay flat I am up on row 15 and still has ripples. could you email me with any thoughts on this love the way it looks in the picture. I would love to see a picture. If you could send a picture of it to mama at thetucker dot com I’ll see if I can figure out what is going on. I simply love this blanket. I have made 2 of them, with three colors alternating. It is so simple to start and the pattern is so easy once you get started. Hey there! How many rows did you do to finish the extra large size? This is a beautiful pattern. I just discovered chainless foundation. Do you have scarf patterns or can I use this to make scarves? How can I join your site? Thank you. Any of the NBC afghans can be made as scarves. All the patterns tell what number of beginning chain spaces are needed, such as an odd number or a multiple of four plus one. We don’t have a way to join the site yet, but are working on it. We will let you know what that is ready. I haven’t removed any of the videos. I haven’t done a video for this specific blanket yet, but plan on having it in the next few weeks. Was it one of the videos for one of the other No Beginning Chain blankets? I am still learning new things of the pattern keep bringing of the pattern of Crochet. There is a printer icon at the top of the pattern. Use that to print. It produces a clean printable version without the comments. LOVE your NBC technique, and so appreciate your generosity in sharing these beautiful patterns (not to mention all the personal assistance you offer on your website). Thank you so much for sharing your lovely patterns! I recently began crocheting baby blankets for my local pregnancy center, and became bored with the few patterns I have. I love the variety as well as the beauty of these patterns. I would like to make this for a queen size bed for my daughter for Christmas could you tell me the number of chains I would need to start with I am a fairly new crocheter and would like to know if I could make this pattern or if its a little harder for someone who makes hats and scarfs . You want it to be about 90 inches wide. Start with 94 of the chain/tr spaces. I’ve “tried” working with Homespun and have never finished a project. I either rip it out or just cut the yarn and throw away what’s unfinished. This looks like the perfect project for ALL the Homespun yarn I’ve purchased. I would like to make this large enough for a king sized bed. How would I go about doing that? Thanks! A king size blanket would be 108×90″. For a width of 108″ start with 112 tr/ch spaces. This is such a great idea. I hate the first row of a project and this technique solves that problem. Thanks for sharing! thank you for CHART. I use NBC FOR everything collars, capes ,etc. I love this pattern. It is so simple to follow but the finished product looks like it was a very complicated pattern. 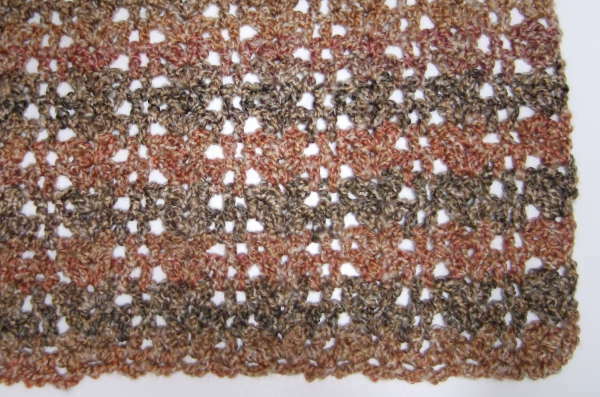 Am creating a prayer shawl using donated Sensations Rainbow Orange Boucle, K-hook, and it looks absolutely beautiful. It will be presented to an Assisted Living resident, unknown to me….. Started with 22 chain and tr spaces, and finished length will be about 6 feet.